A bit of a random problem I came across whilst testing the Single File Restore feature of NetApp’s Virtual Storage Console. - NetApp Virtual Storage Console (VSC) 4.1 with Backup and Recovery Version 5.0 (Build: 1445). - VMware vCenter Server version 5.1. - The VSC is installed on a Windows Server 2008 R2 box which has IPv6 disabled! - The VSC and vCenter are on the same server as per best practice, and - being a lab environment - SQL Express is on there too. 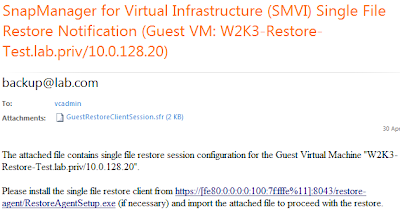 Using the Single File Restore feature of the VSC, the restore notification email is delivered successfully but contains an IPv6 addressed web link. The environment is all IPv4 so this doesn’t work. Substituting the IPv6 address with the IPv4 address of the VSC server makes the download possible. Error - There was no endpoint listening at https://[FE80:0000:0000:0000:0000:0100:007F:FFFE]:8043/smvi/services/hvss that could accept the message. This is often caused by an incorrect address or SOAP action. See InnerException, if present, for more details. Examining the contents of the GuestRestoreClientSession.sfr reveals the same IPv6 address. Set the ‘Restore agent installer location’ to the correct IPv4 address. Suspend any SMVI backup jobs. Stop the service ‘NetApp SnapManager for Virtual Infrastructure’. Restart the service ‘NetApp SnapManager for Virtual Infrastructure’. Resume any SMVI backup jobs. Unknown (I don’t have a clue)! In this instance, IPv6 had been disabled from before the VMware vCenter software and the VSC were installed. The IPv6 address could not be found in any config file anywhere. - which turned out to be in the TCP/IP properties of the VIM_SQLEXP SQL instance and the IP5 IP Address, but there’s no reason why SMVI should have picked this up. The SQL entry was changed to the IPv4 address, but his made no difference. 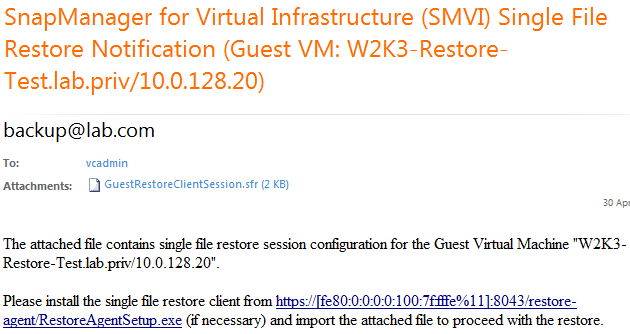 Even re-installing the VSC (retaining the SMVI config for backup and restore purposes) onto a new server, same problem! 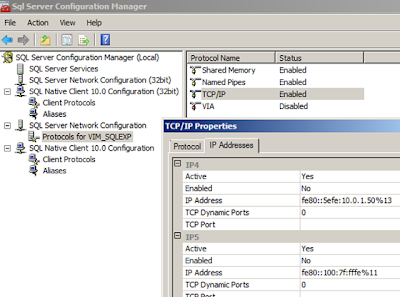 In the process of troubleshooting this, I learnt the SMVI backup and restore/migrate process very well. 1. Suspend all the backup jobs. 2. Stop the ‘NetApp SnapManager for Virtual Infrastructure’ service. 4. Uninstall the NetApp Virtual Storage Console 4.1 for VMware vSphere software. 5. Reinstall the NetApp Virtual Storage Console 4.1 for VMware vSphere software (on a different server). 6. Stop the ‘NetApp SnapManager for Virtual Infrastructure’ service. 8. Start the ‘NetApp SnapManager for Virtual Infrastructure’ service. 9. Resume any SMVI backup jobs. Note: With restoring the VSC config itself, it is sufficient to just add/edit the storage controllers under ‘Monitoring and Host Configuration’ > Overview. Worked great for me... Thanks!